90 posts categorized "Credit Reporting Agencies"
House Oversight Committee Report On The Equifax Data Breach. Did The Recommendations Go Far Enough? "In 2005, former Equifax Chief Executive Officer(CEO) Richard Smith embarked on an aggressive growth strategy, leading to the acquisition of multiple companies, information technology (IT) systems, and data. While the acquisition strategy was successful for Equifax’s bottom line and stock price, this growth brought increasing complexity to Equifax’s IT systems, and expanded data security risks... Equifax, however, failed to implement an adequate security program to protect this sensitive data. As a result, Equifax allowed one of the largest data breaches in U.S. history. Such a breach was entirely preventable." "On March 7, 2017, a critical vulnerability in the Apache Struts software was publicly disclosed. Equifax used Apache Struts to run certain applications on legacy operating systems. The following day, the Department of Homeland Security alerted Equifax to this critical vulnerability. Equifax’s Global Threate and Vulnerability Management (GTVM) team emailed this alert to over 400 people on March 9, instructing anyone who had Apache Struts running on their system to apply the necessary patch within 48 hours. The Equifax GTVM team also held a March 16 meeting about this vulnerability. Equifax, however, did not fully patch its systems. Equifax’s Automated Consumer Interview System (ACIS), a custom-built internet-facing consumer dispute portal developed in the 1970s, was running a version of Apache Struts containing the vulnerability. Equifax did not patch the Apache Struts software located within ACIS, leaving its systems and data exposed." "On May 13, 2017, attackers began a cyberattack on Equifax. The attack lasted for 76 days. The attackers dropped “web shells” (a web-based backdoor) to obtain remote control over Equifax’s network. They found a file containing unencrypted credentials (usernames and passwords), enabling the attackers to access sensitive data outside of the ACIS environment. The attackers were able to use these credentials to access 48 unrelated databases." "Attackers sent 9,000 queries on these 48 databases, successfully locating unencrypted personally identifiable information (PII) data 265 times. The attackers transferred this data out of the Equifax environment, unbeknownst to Equifax. Equifax did not see the data exfiltration because the device used to monitor ACIS network traffic had been inactive for 19 months due to an expired security certificate. On July 29, 2017, Equifax updated the expired certificate and immediately noticed suspicious web traffic..."
Findings so far: 1) growth prioritized over security while archiving highly valuable data; 2) antiquated computer systems; 3) failed security patches; 4) unprotected user credentials; and 5) failed intrusion detection mechanism. Geez! "When Equifax informed the public of the breach on September 7, the company was unprepared to support the large number of affected consumers. The dedicated breach website and call centers were immediately overwhelmed, and consumers were not able to obtain timely information about whether they were affected and how they could obtain identity protection services." "Equifax should have addressed at least two points of failure to mitigate, or even prevent, this data breach. First, a lack of accountability and no clear lines of authority in Equifax’s IT management structure existed, leading to an execution gap between IT policy development and operation. This also restricted the company’s implementation of other security initiatives in a comprehensive and timely manner. As an example, Equifax had allowed over 300 security certificates to expire, including 79 certificates for monitoring business critical domains. "Second, Equifax’s aggressive growth strategy and accumulation of data resulted in a complex IT environment. Equifax ran a number of its most critical IT applications on custom-built legacy systems. Both the complexity and antiquated nature of Equifax’s IT systems made IT security especially challenging..."
Findings so far: 6) inadequate post-breach response; and 7) complicated IT structure making updates difficult. Geez! "1: Empower Consumers through Transparency. Consumer reporting agencies (CRAs) should provide more transparency to consumers on what data is collected and how it is used. A large amount of the public’s concern after Equifax’s data breach announcement stemmed from the lack of knowledge regarding the extensive data CRAs hold on individuals. CRAs must invest in and deploy additional tools to empower consumers to better control their own data..."
"2: Review Sufficiency of FTC Oversight and Enforcement Authorities. Currently, the FTC uses statutory authority under Section 5 of the Federal Trade Commission Act to hold businesses accountable for making false or misleading claims about their data security or failing to employ reasonable security measures. Additional oversight authorities and enforcement tools may be needed to enable the FTC to effectively monitor CRA data security practices..."
"3: Review Effectiveness of Identity Monitoring and Protection Services Offered to Breach Victims. The General Accounting Office (GAO) should examine the effectiveness of current identity monitoring and protection services and provide recommendations to Congress. In particular, GAO should review the length of time that credit monitoring and protection services are needed after a data breach to mitigate identity theft risks. Equifax offered free credit monitoring and protection services for one year to any consumer who requested it... This GAO study would help clarify the value of credit monitoring services and the length of time such services should be maintained. The GAO study should examine alternatives to credit monitoring services and identify addit ional or complimentary services..."
"4: Increase Transparency of Cyber Risk in Private Sector. Federal agencies and the private sector should work together to increase transparency of a company’s cybersecurity risks and steps taken to mitigate such risks. One example of how a private entity can increase transparency related to the company’s cyber risk is by making disclosures in its Securities and Exchange Commission (SEC) filings. In 2011, the SEC developed guidance to assist companies in disclosing cybersecurity risks and incidents. According to the SEC guidance, if cybersecurity risks or incidents are “sufficiently material to investors” a private company may be required to disclose the information... Equifax did not disclose any cybersecurity risks or cybers ecurity incidents in its SEC filings prior to the 2017 data breach..."
"5: Hold Federal Contractors Accountable for Cybersecurity with Clear Requirements. The Equifax data breach and federal customers’ use of Equifax identity validation services highlight the need for the federal government to be vigilant in mitigating cybersecurity risk in federal acquisition. The Office of Management and Budget (OMB) should continue efforts to develop a clear set of requirements for federal contractors to address increasing cybersecurity risks, particularly as it relates to handling of PII. There should be a government-wide framework of cybersecurity and data security risk-based requirements. In 2016, the Committee urged OMB to focus on improving and updating cybersecurity requirements for federal acquisition... The Committee again urges OMB to expedite development of a long-promised cybersecurity acquisition memorandum to provide guidance to federal agencies and acquisition professionals..."
"6: Reduce Use of Social Security Numbers as Personal Identifiers. The executive branch should work with the private sector to reduce reliance on Social Security numbers. Social Security numbers are widely used by the public and private sector to both identify and authenticate individuals. Authenticators are only useful if they are kept confidential. Attackers stole the Social Security numbers of an estimated 145 million consumers from Equifax. As a result of this breach, nearly half of the country’s Social Security numbers are no longer confidential. To better protect consumers from identity theft, OMB and other relevant federal agencies should pursue emerging technology solutions as an alternative to Social Security number use." "7: Implement Modernized IT Solutions. Companies storing sensitive consumer data should transition away from legacy IT and implement modern IT security solutions. Equifax failed to modernize its IT environments in a timely manner. The complexity of the legacy IT environment hosting the ACIS application allowed the attackers to move throughout the Equifax network... Equifax’s legacy IT was difficult to scan, patch, and modify... Private sector companies, especially those holding sensitive consumer data like Equifax, must prioritize investment in modernized tools and technologies...."
The history of corporate data breaches and the above list of corporate failures by Equifax both should be warnings to anyone in government promoting the privatization of current government activities. Companies screw up stuff, too. Recommendation #6 is frightening in that it hasn't been implemented. Yikes! No federal agency should do business with a private sector firm operating with antiquated computer systems. And, if Equifax can't protect the information it archives, it should cease to exist. While that sounds harsh, it ain't. Continual data breaches place risks and burdens upon already burdened consumers trying to control and protect their data. What are your opinions of the report? Did it go far enough? "The NCTUE is a consumer reporting agency founded by AT&T in 1997 that maintains data such as payment and account history, reported by telecommunication, pay TV and utility service providers that are members of NCTUE... there are four "exchanges" that feed into the NCTUE’s system: the NCTUE itself, something called "Centralized Credit Check Systems," the New York Data Exchange (NYDE), and the California Utility Exchange. According to a partner solutions page at Verizon, the NYDE is a not-for-profit entity created in 1996 that provides participating exchange carriers with access to local telecommunications service arrears (accounts that are unpaid) and final account information on residential end user accounts. The NYDE is operated by Equifax Credit Information Services Inc. (yes, that Equifax)... The California Utility Exchange collects customer payment data from dozens of local utilities in the state, and also is operated by Equifax (Equifax Information Services LLC)." This surfaced after consumers with security freezes on their credit reports at the three major credit reporting agencies (e.g., Experian, Equifax, TransUnion) found fraudulent mobile phone accounts opened in their names. This shouldn't have been possible since security freezes prevent credit reporting agencies from selling consumers' credit reports to telecommunications companies, who typically perform credit checks before opening new accounts. So, the credit information must have come from somewhere else. It turns out, the source was the NCTUE. "... the NCTUE makes it fairly easy to obtain any records they may have on Americans. Simply phone them up (1-866-349-5185) and provide your Social Security number and the numeric portion of your registered street address." The Krebs on Security blog also explain the expired SSL certificate used by Equifax which prevents serving web pages in a secure manner. That was simply inexcusable, poor data security. "... THE NCTUE IS NOT RESPONSIBLE FOR, AND EXPRESSLY DISCLAIM, ALL LIABILITY FOR, DAMAGES OF ANY KIND ARISING OUT OF USE, REFERENCE TO, OR RELIANCE ON ANY INFORMATION CONTAINED WITHIN THE SITE. All content located at or available from the NCTUE website is provided “as is,” and NCTUE makes no representations or warranties, express or implied, including but not limited to warranties of merchantability, fitness for a particular purpose, title or non-infringement of proprietary rights. Without limiting the foregoing, NCTUE makes no representation or warranty that content located on the NCTUE website is free from error or suitable for any purpose; nor that the use of such content will not infringe any third party copyrights, trademarks or other intellectual property rights. Links to Third Party Websites: Although the NCTUE website may include links providing direct access to other Internet resources, including websites, NCTUE is not responsible for the accuracy or content of information contained in these sites.."
Huh?! As is? The data NCTUE collected is being used for credit decisions. Reliability and accuracy matters. And, there are more concerns. While at the NCTUE site, I briefly browsed the credit freeze information, which is hosted on an outsourced site, the Exchange Service Center (ESC). What's up with that? Why a separate site, and not a cohesive single site with a unified customer experience? This design gives the impression that the security freeze process was an afterthought. There's more. 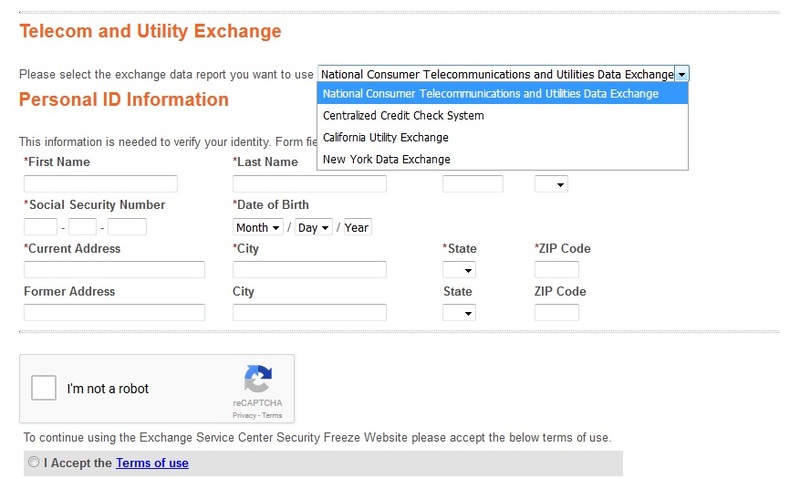 When placing a security freeze, the ESC site includes a drop-down menu asking consumers to pick an exchange (e.g., NCTUE, Centralized Credit Check System, California Utility Exchange, NYDE). The confusing drop-down menu appears in the image on the right. Which menu option is the global security freeze? Is there a global option? The form page doesn't say, and it should. Why would a consumer select one of the exchanges? Perhaps, is this another slick attempt to limit the effectiveness of security freezes placed by consumers. Not good. What can consumers make of this? First, the NCTUE site seems to be a slick way for Equifax to skirt the security freezes which consumers have placed upon their credit reports. Sounds like a definite end-run to me. Surprised? I'll bet. Angry? I'll bet, too. We consumers paid good money for security freezes on our credit reports. Second, the combo NCTUE/ESC site seems like some legal, outsourcing ju-jitsu to avoid all liability, while still enjoying the revenues from credit-report sales. The site left me with the impression that its design, which hasn't kept pace during the years with internet best practices, was by a committee of attorneys focused upon serving their corporate clients' data collection and sharing needs while doing the absolute minimum required legally -- rather than a site focused upon the security needs of consumers. I can best describe the site using an old film-review phrase: a million monkeys with a million crayons would be hard pressed in a million years to create something this bad. Third, credit reporting agencies get their data from a variety of sources. So, their business model is based upon data sharing. NCTUE seems designed to effectively do just that, regardless of consumers' security needs and wishes. Fourth, this situation offers several reminders: a) just about anyone can set up and operate a credit reporting agency. No special skills nor expertise required; b) there are both national and regional credit reporting agencies; c) credit reports often contain errors; and d) credit reporting agencies historically have outsourced work, sometimes internationally -- for better or worse data security. Fifth, you now you know what criminals and fraudsters already know... how to skirt the security freezes on credit reports and gain access to consumers' sensitive information. The combo NCTUE/ESC site is definitely a high-value target by criminals. My first impression of the NCTUE site: haphazard design making it difficult for consumers to use and to trust it. What do you think? The massive privacy and data security breach at Facebook.com involving Cambridge Analytica has heightened many users' sensitivity to the advertising practices by the social networking service. 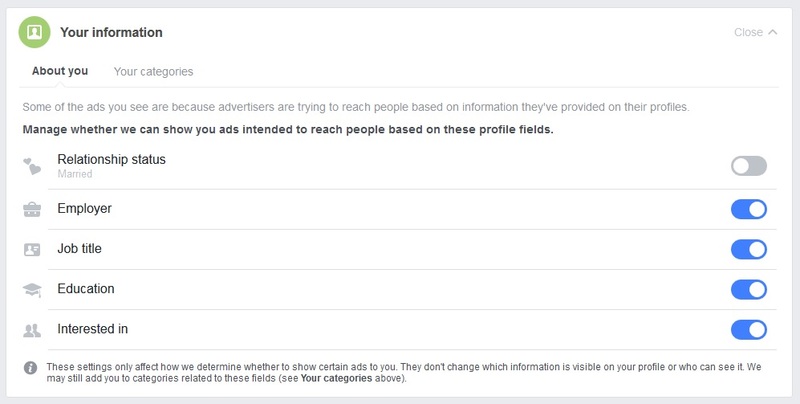 Many Facebook users want to know the exact list of advertiser tracking them. The default view of list #1 displays 12 advertisers tracking you. There probably are many more in your list. Select "Show More" to view more advertisers. Facebook doesn't make it easy. The module lacks a "Show All" button, which forces users to repeatedly select "Show More." Not good. Come on Facebook! You can do better. "These advertisers are running ads using a contact list they uploaded that includes your contact info. This info was collected by the advertiser, typically after you shared your email address with them or another business they've partnered with." The key phrase to remember: or another business they've interacted with. So, list #1 includes not only advertisers but also affiliates or business partners. Not good. More Facebook being Facebook. I selected "Show More" about two dozen times to view my complete list: 235 advertisers tracking me, and collecting data about me. 235 advertisers even though I never used the Facebook mobile app, and had already disabled the Facebook API platform on my account years ago! Not good. Your mileage will vary. There may be fewer or more advertisers on your list. My list #1 included both advertisers I expected and many I didn't expect. The advertisers I expected to see brands I currently do business with (e.g., Marriott Rewards, ACLU), brands I no longer do business with (e.g., Bank of America, AT&T), and/or brands whose Facebook pages I "Liked" or left comments on. The advertisers who I didn't expected to see included politicians in other states I've neither visited nor live in, brands I've never purchased nor interacted with in any manner, brands I have never "Liked," and more. "I looked at my list and it's crazy. Will follow the opt-out links tomorrow and clear them out. Cardi B was in my list of FB advertisers." A rapper? That's too funny. I guess that's to be expected if you stream and share music online via Facebook. Me? I don't stream music online because that is another way to be tracked. Instead, I enjoy listening to CDs privately in my home. I prefer to keep my home a truly private place. "You, can thank the "data providers" for this mess. Mark Zuckerberg spent roughly 11 hours testifying in front of Congressional committees... One thing that got very little attention was the concept of “data brokers,” middleman businesses that collect consumer information and sell it to companies. Facebook stopped using them just last month. However, that long string of companies, personalities, and alternative rock bands is a result of Facebook’s old program... after the Cambridge Analytica scandal broke, but before Mark Zuckerberg’s marathon testimony in front of Congress, Facebook announced that it was ending a program called Partner Categories, canceling a long-standing relationship between the social network and data brokers. The change was announced in a short statement, but it has big implications for your personal information and the agencies that collect and sell it." "The ability to target advertising is what makes Facebook its money—roughly $40 billion last year... while you provide lots of user information to Facebook, advertisers typically want even more... and that’s where data brokers come in. Facebook calls on brokers like Acxiom, Epsilon, and TransUnion to act as a conduit between Facebook and individual advertisers looking to reach targeted audiences..."
Readers of this blog may recognize TransUnion, one of the three major credit reporting agencies. 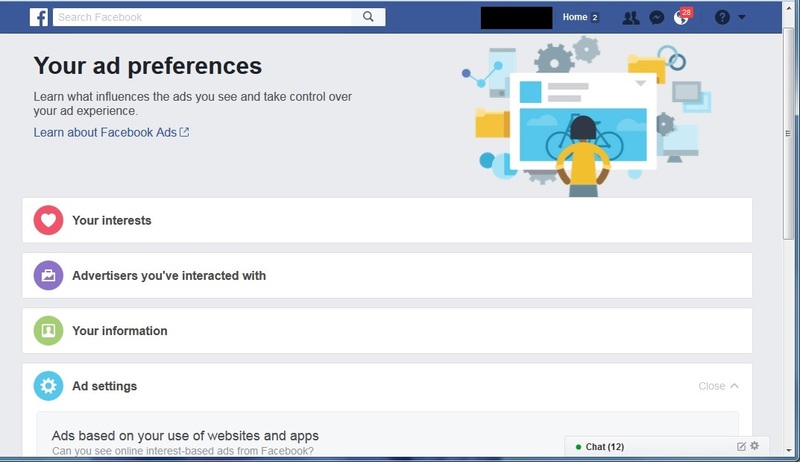 So, the "advertisers" on Facebook tracking you (and data harvesting) include a variety of entities: traditional advertisers, business partners, affiliates, data brokers, and their intermediaries. It's called "surveillance capitalism" for good reasons. Many companies besides Facebook do it. The above image is from 2017. back then I disabled all of the active toggles you see. Deactivating these toggles might minimize the number of ads displays, but it won't stop the tracking and data collection. The Popular Science article includes links to several opt-out mechanisms for major data brokers. You could (and should) use those. However, two key problems remain. First, these opt-out links should be easily accessible within Facebook. They aren't. This forces consumers to waste time hunting for the opt-out mechanisms, when Facebook has the expertise to provide them. Facebook probably knows that many consumers will give up and quit, rather than hunt for opt-out links. It's great that Popular Science did a lot of the work for consumers. Didn't know that Experian plays in both ponds: credit reporting and data brokerage? Most people probably don't know. 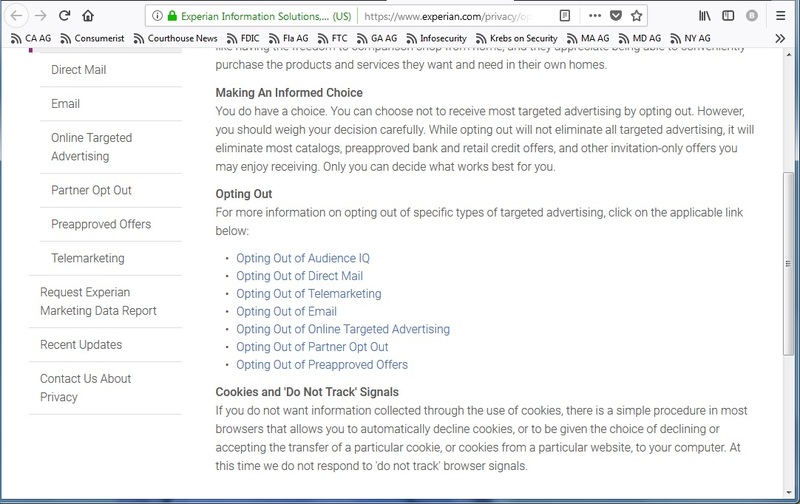 Experian's site lacks a unified, single opt-out mechanism which forces consumers to wade through seven different mechanisms and methods; some of which are paper-based and lack an online method. Not good! TransUnion's opt-out mechanism isn't much better. And, it raises more questions than it answers? It links to the OptOutPrescreen.com site, which I completed way back in 2007. Did my Facebook membership undo that? Or is there some other data sharing at work, which the OptOutprescreen doesn't cover? TransUnion's page doesn't explain, and nither does Facebook's page. Not good. Some people choose to use ad-blocking software (e.g., Adblock Plus, Ghostery) to suppress the display of online ads, but that probably won't stop the tracking and data collection internal to Facebook. There's no substitute for Facebook giving its users internal tools to completely disable and opt out of the tracking and data collection. How many advertisers are on your list? 200 or more? 300? 400? Any surprises on your list? "Equifax Inc. today announced that the company has confirmed the identities of U.S. consumers whose partial driver’s license information was taken. Equifax was able to identify these consumers by referencing other information in proprietary company records that the attackers did not steal, and by engaging the resources of an external data provider. Through these additional efforts, Equifax was able to identify approximately 2.4 million U.S. consumers whose names and partial driver’s license information were stolen, but who were not in the previously identified affected population discussed in the company’s prior disclosures about the incident. This information was partial because, in the vast majority of cases, it did not include consumers’ home addresses, or their respective driver’s license states, dates of issuance, or expiration dates... Today’s newly identified consumers were not previously informed because their SSNs were not stolen together with their partial driver’s license information..."
Equifax will notify the newly identified breach victims via U.S. Postal mail, and will offer them complimentary identity theft protection and credit file monitoring services. The timeline for the massive breach: intrusions occurred in May (2017), Equifax staff first discovered the intrusions in July (2017); Equifax notified the publicy in September (2017); and now identified 2.4 million more breach victims (March, 2018). Equifax said in September (2017) that 143 million persons were affected. That was about 44 percent of the United States population. In October (2017), Equifax revised upward the number affected by 2.5 million to 145.5 million persons. What's the new total? Equifax didn't have the guts to admit it in its March 1st announcement. Since the company doesn't seem to want to admit it, I'm going with 147.9 million persons affected -- about 45.6 percent of the population. So, it took Equifax almost six months after its initial announcement to determine exactly who was affected during its massive data breach. This does not inspire confidence. Instead, it suggests that the company's internal systems and intrusion detection mechanisms failed miserably. Equifax’s Assistance and Information Provided to Consumers Following the Breach was Inadequate. Equifax's latest breach update highlights item #3: the company's failure to promptly notify consumers. When consumers aren't notified promptly, they are unable to take action to protect their sensitive personal and payment information. Have we heard the last from Equifax? Will it provide future updates with even more persons affected? I hope not, but the company's track record suggests otherwise. Equifax has foisted upon the country a cluster f--k of epic proportions = #FUBAR. Businesses and consumers depend upon secure, reliable credit reports. The United States economy relies upon it, too. Equifax executives need to experience direct consequences: fines, terminations, and jail time. Without consequences, executives won't adequately secure sensitive personal and financial information -- and this will happen again. What do you think? Equifax Took Advantage of Federal Contracting Loopholes and Failed to Adequately Protect Sensitive IRS Taxpayer Data. Soon after the breach was announced, Equifax and the IRS were engulfed in controversy amid news that the IRS was signing a new $7.2 mil lion contract with the company. Senator Warren’s investigation revealed that Equifax used contracting loopholes to force the IRS into signing this “bridge” contract, and the contract was finally cancelled weeks later by the IRS after the agency learned of additional weaknesses in Equifax security that potentially endangered taxpayer data. Equifax’s Assistance and Information Provided to Consumers Following the Breach was Inadequate. Equifax took 40 days to prepare a response for the public before finally announcing the extent of the breach – and e ven after this delay, the company failed to respond appropriately. Equifax had an inadequate crisis management plan and failed to follow their own procedures for notifying consumers. Consumers who called the Equifax call center had hours-long waits. The website set up by Equifax to assist consumers was initially unable to give individuals clarity other than to tell them that their information “may” have been hacked – and that website had a host of security problems in its own right. Equifax delayed their public notice in part because the company spent almost two weeks trying to determine precisely which consumers were affected..."
Senator Warren's investigation was one of several underway. The importance of this investigative report cannot be overstated for several reasons. First, the three national credit reporting agencies (e.g., Equifax, Experian, and TransUnion) maintain reports about the credit histories and worthiness of all adults in the United States. That's extremely sensitive -- and valuable -- information that affects just about everyone. And, the country's economy relies on the accuracy and security of credit reports. Second, Mick Mulvaney, the interim director appointed by President Trump to head the Consumer Financial Protection Bureau (CFPB), announced a halt to its investigation of the Equifax breach. This makes Senator Warren's investigative report even more important. Third, the massive Equifax data breach affected at least 143 million persons in the United States... about 44 percent of the United States population... almost half. Nobody in their right mind wants to experience that again, so a thorough investigation seems wise, appropriate, and necessary. The credit reporting industry includes national agencies, regional agencies, and a larger list of "consumer reporting companies" -- businesses that collect information about consumers into reports for a variety of decisions about credit, employment, residential rental housing, insurance, and more. The CFPB compiled this larger list in 2017 (Adobe PDF; 264k bytes). "Federal Legislation is Necessary to Prevent and Respond to Future Breaches. Equifax and other credit reporting agencies collect consumer data without permission, and consumers have no way to prevent their data from being collected and held by the company – which was more focused on its own profits and growth than on protecting the sensitive personal information of millions of consumers. This breach and the response by Equifax illustrate the need for federal legislation that (1) establishes appropriate fines for credit reporting agencies that allow serious cybersecurity breaches on their watches; and (2) empowers the Federal Trade Commission to establish basic standards to ensure that credit reporting agencies are adequately protecting consumer data." Download the full report (Adobe PDF; 672k bytes) titled, "Bad Credit: Uncovering Equifax's Failure to Protect Americans' Personal Information." Senator Warren's report is also available here. The CFPB list of consumer reporting companies is also available here. My personal view: data breaches like Equifax's will stop only after executives at credit reporting agencies suffer direct consequences for failed information security: jail time or massive personal fines. There has to be consequences. What do you think? "... scaled back its investigation into a data breach at credit reporting agency Equifax Reuters reported Monday. The CFPB's interim director Mick Mulvaney, appointed by the Trump administration, has not followed "routine steps" that would be involved in a probe, including issuing subpoenas against Equifax and seeking sworn testimony from its executives, Reuters reported. And when regulators at the Federal Reserve, Federal Deposit Insurance Corp. and Office of the Comptroller of the Currency have offered to help examine the credit bureaus, the CFPB reportedly declined the help... several politicians and consumer advocates said this is the latest sign the CFPB under Mulvaney will be weak in its prosecution of financial firms... The Federal Trade Commission is also investigating the breach, but imposes financial penalties more rarely than the CFPB does... Mulvaney wrote in an op-ed published in January The Wall Street Journal that the bureau will no longer “push the envelope.” “When it comes to enforcement, we will focus on quantifiable and unavoidable harm to the consumer,” he wrote..."
The massive Equifax data breach affected at least 143 million persons in the United States. That was about 44 percent of the United States population... almost half. Nobody in their right mind wants to experience that again, so a thorough investigation seems wise, appropriate, and necessary. "Consumer advocates are also concerned that the CFPB will get rid of the database of complaints related to current investigations, which allows the public to air complaints publicly. It also provided a direct way for the public to engage with the CFPB’s activities. The database contains hundreds of thousands of complaints filed by consumers about issues ranging from predatory debt collectors to errors on credit reports. Republicans have argued that the database shouldn’t be public, while consumer advocates say the public list of complaints is an important tool for consumers. A public database has been “a powerful mechanism for keeping financial predators accountable to consumers,” Melissa Stegman, senior policy counsel at the Center for Responsible Lending, a nonprofit based in Durham, N.C., told MarketWatch... Mulvaney announced in January the CFPB may reconsider a rule Cordray implemented for payday lenders that was designed to protect consumers and limit the amount lenders are allowed to loan them, if they do not meet certain borrowing criteria." In March 2012, the CFPB began accepting complaints from consumers about bank accounts (e.g., checking, savings, CDs, poor customer service, etc.). Later in 2012, the CFPB began accepting complaints about student loans, credit cards, and credit reports. 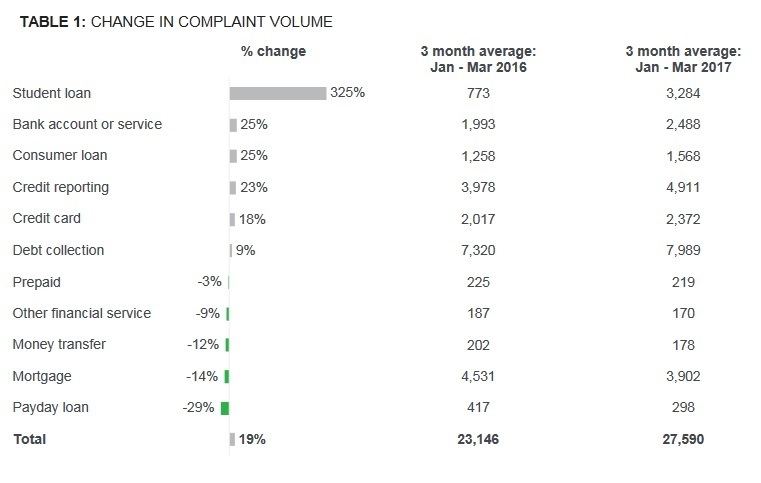 In March 2013, the CFPB first released data results from its Consumer Complaints database. This quickly became a reliable source of tracking key financial issues affecting (and abusing) consumers. While campaigning for President, Donald Trump positioned himself as a populist... promoting "populist nationalism." A true populist would not appoint a CFPB director that weakens or abandons protection for consumers. What do you think? What happened: we recently learned your Discover card account might have been part of a data breach. Please know, this breach did not involve Discover card systems. What we are doing to resolve: we are issuing you a new card with a new account number, security code, and expiration date to reduce the possibility of fraud on your account... So as a safety precaution, we are issuing you a new card to protect your Discover card account information from being misused"
Good. I like the proactive protection, and hope that the retailer absorbed the costs of replacement cards for all affected consumers like me. However, the letter from Discover didn't identify the retailer. I called Discover's customer service hotline. The phone representative wouldn't identify the retailer, either. I'd shopped at four retail stores during the past month, and assumed it was one of them. It wasn't. "We are writing with regard to the cybersecurity incident Equifax announced on September 7, 2017. At Equifax, our priorities with regard to this incident are transparency and continuing to provide timely, reassuring support to every consumer. You are receiving this letter because the credit or debit card number used to pay for a freeze service, credit score, or disclosure of your Equifax credit file was accessed. We have no evidence that your credit file itself was accessed." So, confirmation that it was Equifax's fault. What to make of this? Keep reading. First, thanks Equifax for the postal mail notice. However, this isn't timely communication. Why? Equifax considers it's September 7th press release timely communication. How many consumers read Equifax press releases? Did you? My guess, most don't. Thankfully, I read online newspapers and was aware of the breach soon after Equifax's September 7th announcement. Yet, my postal letter from Equifax arrived seven weeks after its September 7th press release (and almost three months after it first discovered the breach on July 29). This incident is a reminder for consumers not to rely upon postal mail for breach notices. Many states' breach notice laws allow for companies to post public notices online in websites and/or in newspaper advertisements. This allows companies to skip (the expense of) mailing individual breach notices via postal mail. "On September 7, 2017, Equifax notified U.S. customers of the data security incident, including that 143 million U.S. consumers were impacted. On October 2, 2017, following the completion of the forensic portion of the investigation of the incident, Equifax announced that the review determined that approximately 2.5 million additional U.S. consumers were potentially impacted. Equifax also announced that credit card numbers for approximately 209,000 consumers and certain dispute documents, which included personal identifying information, for approximately 182, 000 consumers were accessed." So, I am one of the "lucky" 209,000 consumers in the United States whose payment information was exposed stolen in addition to other sensitive personal information. Thanks Equifax for failing to protect my sensitive personal -- and payment -- information you are entrusted to protect. Second, to upgrade earlier this year from slow, antiquated DSL to fiber broadband from Verizon, I used my credit card to pay for a temporary lift of the security freeze on my Equifax credit report. Why did Equifax retain my payment information for this transaction? Why did it retain that payment information in a complete and UN-encrypted format? Refer to your Merchant Operating Regulations for further card-not-present (CNP) requirements for the submission of sales." So, it seems that Equifax failed to follow Discover's data security guidelines for merchants. (Browse privacy guidelines for merchants by other card issuers.) I do not have any ongoing services or subscriptions with Equifax, so there seems to be no need for it to retain my full credit card payment information. Not good. I called the Equifax customer service hotline. The phone representative could not explain why Equifax retained my payment information. Not good. Third, Equifax failed to customize the letter for my situation. In 2008, I placed security freezes on my credit reports at Equifax, Experian, and TransUnion. So, Equifax already knows I have a security freeze in place, and failed to customize the letter accordingly. Rather than explain what applies to customers in my situation, instead the letter repeated the same general fraud-prevention advice for all consumers: how to contact the FTC, visit annualcreditreport.com for free copies of credit reports, file a police report if a victim of identity theft, place a fraud alert or security freeze on my credit reports for protections, and how to lift/remove an existing security freeze. Not good. This was fast becoming a crappy customer experience. "What is the difference between a credit file lock and a security freeze? At their most basic level, both prevent new creditors from accessing your Equifax credit report, unless you give permission or take an action such as removing, unlocking or lifting the freeze or lock. Both a security freeze and a credit file lock help prevent a lender or other creditor from accessing a consumer’s credit report to open unauthorized new accounts. Security freezes were created in the early 2000’s, are subject to regulation by each state and use a PIN based system for authentication. Credit file locks were created more recently, are mobile-enabled and use modern authentication techniques, such as username and passwords and one-time passcodes for better user experience." So, the "credit file lock" feature is new and different from a security freeze. The new feature allows mobile users to easily and quickly unlock/lock your Equifax credit reports. That seems beneficial for consumers needing frequent and quick access to credit. According to the FAQ page, the new feature will be "free, for life." The above description gives the impression that security freezes are antiquated. "The types of personal information we collect and share depend on the product or service you have with us. This information can include: Social Security number and credit card information; Payment history and transaction history; Credit scores and credit history"
The "depend on the product or service you have" seems vague and broad. Just tell me! Plus, "transaction history" could include geo-location: where you bought something since some purchases are made at brick-and-mortar retail stores. It could also include when and where you use the "credit file lock" feature. So, even though the policy doesn't explicitly mention geo-location data collection, it seems wise to assume that it does. For the new "credit file lock" feature to work on your phone, it probably needs to know your location -- where you and your phone are. So, this new feature seems to be a slick way for Equifax to collect (and archive) location data about when, where, the duration, and frequency of consumers' travels in the physical world -- something it couldn't get previously through the traditional security freeze process. Remember, any app on your smartphone can collect location data. Plus, the "credit file lock" feature won't work with a security freeze in place. According to the customer service representative, consumers need to remove a security freeze for the credit file lock feature to work. This is a new, important wrinkle which consumers must understand in order to make informed decisions. The representative said it would be free to remove the security freeze on my Equifax credit report in order to use the new feature. I asked if the TrustedID Premier service Equifax offers would work with credit reports from Innovis. The rep said no. The duration of my phone call was long since the representative needed to place me on hold and check with others in order to answer my questions. This did not instill confidence. Plus, this lengthy question-and-answer page about Equifax's services indicates that many consumers (and perhaps some Equifax customer service representatives) don't fully understand the differences between security freezes, credit file locks, and other service features. Fifth, the letter from Equifax did not mention any of the new threats nor the additional protection steps consumers must take, both of which you can read about in this October 10th blog post. Even though I've written about privacy, data breaches and credit monitor for the past 10+ years, like you there are new things to learn. It seems that Equifax is hoping that breach victims will take the easy route: enroll in TrustedID Premier -- which is free for now, but will likely cost you later. Overall, for me it was a crappy post-breach customer experience with Equifax. I expected better -- better data security and a better post-breach support. Plenty of news articles have documented the security problems, failures, and post-breach problems with Equifax's breach site. What are your opinions? What do you think of the new credit file lock feature? If you've used it, share your experience in the comments section below the image. For what appears to be decades, the credit rating agency Equifax has quietly layered three more years of tarnish on the credit histories of hundreds of thousands of people who had filed for bankruptcy under Chapter 13. While its competitors, TransUnion and Experian, placed a flag on such histories for seven years, Equifax left it on the reports of Chapter 13 filers who failed to complete their bankruptcy plans for 10. After ProPublica asked about the difference in its policy, the company said it now leaves the flag on for seven years, but refused to say when and why the change was made. The consequences of Equifax’s harsher policy were likely life-changing for some unlucky people. As Experian warns consumers on its website, “having a bankruptcy in your credit history will seriously affect your ability to obtain credit for as long as it remains on your report. It can also affect your ability to qualify for things like an apartment, utilities, and even employment. Even car insurance rates may be affected.” Without knowing why, consumers could have been turned down for apartments because landlords checked their Equifax report rather than those from Experian or TransUnion. Why Equifax’s policy was different is unclear and the company would not address it. But that such a discrepancy had gone unnoticed and unaddressed for so long underscores how lightly regulated the industry is. ProPublica contacted all of the major credit agencies earlier this year as part of our ongoing series on consumer bankruptcy. The policies of TransUnion and Experian were similar: People who filed under Chapter 7, which wipes out most debts, would have a flag on their report for 10 years; those who filed under Chapter 13, which usually involves five years of payments before debts are forgiven, would have a flag for seven. Equifax had the same Chapter 7 policy. But the company had a key difference in its policy for Chapter 13 filers: Those who were unable to complete their five years of payments and had their cases dismissed were saddled with a flag for three additional years. This difference had the potential for widespread impact. About half of Chapter 13 cases are dismissed, usually because debtors fall behind on payments. From 2008 through 2010, 574,000 Chapter 13 cases were filed and subsequently dismissed, according to our analysis of filings. Under Equifax’s policy of keeping the flag on for 10 years, all those debtors would have a flag on their Equifax report through the end of 2017, but not on their TransUnion and Experian histories. Equifax’s policy also disproportionately affected black consumers, because, as our analysis showed, black debtors are more likely than whites to choose Chapter 13 and have their cases dismissed. It might seem puzzling that such a meaningful policy is not governed by law. While some aspects of credit reporting are, others are simply decided among the agencies themselves. Bankruptcy is a mix of the two. Under the Fair Credit Reporting Act, the longest a bankruptcy can stay on someone’s credit report is 10 years. The credit rating agencies have voluntarily decided to treat Chapter 13 cases differently because Chapter 13 typically involves the repayment of some debt, while Chapter 7 does not. Bistritz-Balkan made a point of saying that Equifax’s previous policy had been legal. Initially, Chapter 7 and Chapter 13 have a similar effect on debtors’ credit scores, one that diminishes over time. Bankruptcy is a negative mark on a debtor’s history, but that doesn’t mean that declaring bankruptcy will invariably damage someone’s credit score. In fact, research shows that most people who declare bankruptcy actually see their score rise in the following months. That’s because the typical score is so low that the negative effect of the bankruptcy is outweighed by the positive effect of wiping out debt. According to Zachary Anderson, a spokesman for FICO, the median FICO score for consumers who declared bankruptcy between October 2009 and October 2010, when filings peaked during the Great Recession, was 558 — lower than all but 20 percent of consumers with a credit score. 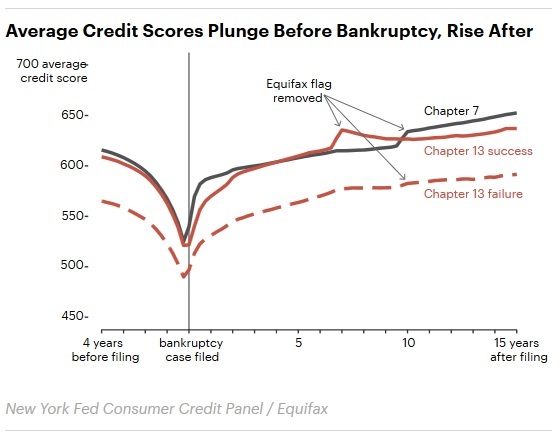 A recent analysis of credit files by Paul Goldsmith-Pinkham, an economist with the Federal Reserve Bank of New York, shows how scores change before and after bankruptcy. In the months prior to filing, as consumers fall deeper into debt, the average credit score plunges. The analysis, using a credit score generated by Equifax that works similarly to a FICO score, found that the average score fell to a low around 520-530, but recovered sharply over the next 6 months, then gradually increased thereafter. The next noticeable bump was seven or 10 years later, depending on the chapter, when the bankruptcy flags were removed. Consumers’ credit scores then jumped by about 10 points. The consumers with the lowest credit scores, the analysis found, were those who had their Chapter 13 cases dismissed. That would be due, in part, to the fact that they tend to be disproportionately low-income and black, two groups with lower credit scores on average. As we showed in our story about bankruptcy in Memphis, where Chapter 13 dismissals are incredibly common, these debtors can find themselves worse off for having tried bankruptcy. They might be even further behind on their debts after their cases are dismissed, making it harder to re-establish their credit. The effect of a dismissal lasts for years. At the very least, Equifax’s change in how it handles Chapter 13s means that the shadow cast by a past bankruptcy isn’t quite as long. You've probably heard the news. The Internal Revenue Service (IRS) gave a no-bid contract to Equifax, even after knowing about the credit reporting agency's massive data breach and arguably lackadaisical data security approaches by management. "This action was to establish an order for third party data services from Equifax to verify taxpayer identity and to assist in ongoing identity verification and validations needs of the Service. A sole source order is required to cover the timeframe needed to resolve the protest on contract TIRNO-17-Z-00024. This is considered a critical service that cannot lapse." "The IRS already had enough trouble dealing with tax fraud, losing $5.8 billion to scammers in 2013... The contract, first reported by Politico,... describes the agreement as a "sole source order," calling Equifax's help a "critical service." When it comes to credit monitoring, there are really only three major names in the US: Equifax, Experian and TransUnion. Experian has also suffered a breach... The IRS actually awarded its authentication service contract to another company in July, Jeffrey Tribiano, the agency's deputy commissioner for operations support told members of Congress. Equifax protested losing the contract to the US Government Accountability Office on July 7, according to documents. The office will decide on the protest by October 16. Until then, the IRS could not move onto its new partner. That meant that when the IRS' old contract with Equifax was supposed to expire on Friday (Sept. 29), Tribiano said, millions of Americans would not have been able to verify their identity with the agency for more than two weeks." Wow! So, the IRS was caught between a rock and a hard place... or "caught between a rock and a hacked place" as C/Net described. Apparently, consumers taxpayers are also caught. Once again, another mess involving Equifax gives consumers that "I've been mugged" feeling. "Equifax Inc. learned about a major breach of its computer systems in March -- almost five months before the date it has publicly disclosed, according to three people familiar with the situation... Equifax hired the security firm Mandiant on both occasions and may have believed it had the initial breach under control, only to have to bring the investigators back when it detected suspicious activity again on July 29, two of the people said..."
"... the Bloomberg story is "attempting to connect two separate cybersecurity events and suggesting the earlier event went unreported." Instead, Equifax says the breach described by Bloomberg was a "security incident involving a payroll-related service." The incident, which Equifax refers to as the "March event," was reported to customers, affected individuals and regulators, as well as covered by the media, it says. "Mandiant has investigated both events and found no evidence that these two separate events or the attackers were related." "In early March, Equifax began notifying individuals whose employers use TALX for payroll services that it had detected unauthorized access to its web-based portal. Employees use the TALX portal to access their W-2, which is the annual income reporting form that U.S. employees need to file their federal tax return. That's also a key document for fraudsters, because it puts them one step closer to being able to fraudulently file and claim a tax refund in someone else's name. In the March attack, hackers had luck accessing TALX accounts by guessing registered users' personal questions, according to Equifax's breach notifications. By answering the questions correctly, fraudsters were able to reset a PIN needed to access an account. With the fresh PIN, they were able to obtain an electronic copy of victims' W-2. The unauthorized access incidents occurred between April 17, 2016, and March 29, 2017, Equifax says..."
"... one goal of the attackers was to use Equifax as a way into the computers of major banks, according to a fourth person familiar with the matter. This person said a large Canadian bank has determined that hackers claiming to sell celebrity profiles from Equifax on the dark web -- information that appears to be fraudulent, or recycled from other breaches -- did in fact steal the username and password for an application programming interface, or API, linking the bank’s back-end servers to Equifax. According to the person and a Sept. 14 internal memo reviewed by Bloomberg, the gateway linked a test and development site used by the bank’s wealth management division to Equifax, allowing the two entities to share information digitally." "... will complicate the company’s efforts to explain a series of unusual stock sales by Equifax executives. If it’s shown that those executives did so with the knowledge that either or both breaches could damage the company, they could be vulnerable to charges of insider trading... New questions about Equifax’s timeline are also likely to become central to the crush of lawsuits being filed against the Atlanta-based company. Investigators and consumers alike want to know how a trusted custodian of so many Americans’ private data could let hackers gain access to the most important details of financial identity... the revelation of an earlier breach will likely raise questions for the company’s beleaguered executives over whether that [March] investigation was sufficiently thorough or if it was closed too soon. For example, Equifax has said that the hackers entered the company’s computer banks the second time through a flaw in the company’s web software that was known in March but not patched until the later activity was detected in July." If true, then consumers are left with more questions: which bank(s)? What fixes have been implemented so this doesn't happen again? Why wasn't this disclosed sooner? How many consumers were affected? Exactly how did the hackers gain access? Was it the same or a different group of hackers? Which consumers' data elements were accessed/stolen? The cynic in me wonders if Equifax executives are using its TALX breach as cover -- to avoid having to admit to another massive (and embarrassing) data breach. Regardless of which news report is accurate, there are plenty of reasons for consumers to feel uneasy about Equifax's breach(es), data security protections, and breach notifications. Equifax is a custodian of extremely valuable and sensitive information about consumers. It makes money selling that information to potential lenders, and consumers have a right to have their questions answered fully. Maybe the various investigations and inquiry by 31 states will provide answers for consumers. Or maybe Congress needs to hold hearings. It's been done before. What do you think? On Friday, September 15, the attorneys general in several states sent a joint letter to Equifax as a result of the credit reporting agency's response to a massive data breach affecting about 143 million persons in the United States. The participating attorneys general are concerned about the impacts and costs to consumers. They want Equifax to respond better to the needs of consumers, extend the duration of the sign-up period for breach victims, and waive the fees of certain services. Perhaps most importantly, they are concerned about Equifax benefiting unjustly due to a situation it created. "... Chief among the issues causing confusion and concern are the inclusion of terms of service that required consumers to waive their rights, the offer of competing fee-based and free credit monitoring services by Equifax, and the charges consumers incur for a security freeze with other credit monitoring companies like Experian, TransUnion, and Innovis. Initially, in order to enroll in the free credit monitoring that Equifax offered to all Americans, it appeared that Equifax attached certain conditions to the offer, including mandatory arbitration, among other things. The fact that Equifax’s own conduct created the need for these services demands that they be offered to consumers without tying the offer to complicated terms of service that may require them to forgo certain rights. It was not until after urging from our offices and public condemnation that Equifax withdrew these objectionable terms from its offer of free credit monitoring. We remain concerned that Equifax continues to market its fee-based services to consumers affected by its data breach. Consumers who view Equifax’s homepage are offered both Equifax fee-based credit monitoring services, as well as its services offered at no cost. Again, at the urging of our offices and following criticism in the media, Equifax made its offer of free credit monitoring services more prominent so that it can be more easily found by consumers. Although these changes are an improvement over the site’s original offering, which presented a much less prominent link when compared to Equifax’s fee-based offering, they do not address all of our concerns. We believe continuing to offer consumers a fee-based service in addition to Equifax’s free monitoring services will serve to only confuse consumers who are already struggling to make decisions on how to best protect themselves in the wake of this massive breach. We object to Equifax seemingly using its own data breach as an opportunity to sell services to breach victims. Selling a fee-based product that competes with Equifax’s own free offer of credit monitoring services to victims of Equifax’s own data breach is unfair, particularly if consumers are not sure if their information was compromised. Equifax cannot reap benefits from confused consumers who are likely only visiting Equifax’s homepage because they are concerned about whether the breach affects them and their families. If there is any substantial benefit consumers can obtain by purchasing the fee-based services over the free credit monitoring, then we strongly suggest that Equifax upgrade its free credit monitoring service to provide equivalent protection. On the other hand, if the services are equivalent, then we fail to understand why Equifax continues to offer its fee-based services to those affected by the breach if equivalent services are obtainable at no cost. Either way, we request that Equifax disable links to its fee-based services until the sign-up period for the free service has ended. Additionally, the cutoff date of November 21, 2017 for consumers to avail themselves of the free services provided appears to us to be rather short-sighted and we suggest that date be extended to at least January 31, 2018. Our offices are also receiving complaints from proactive consumers who have requested a security freeze. Although Equifax is not charging consumers a fee for its own security freeze service, these consumers are furious that they have been forced to pay for a security freeze with other companies, such as Experian and TransUnion, when this privacy breach was no fault of their own. We agree with these consumers that it is indefensible that they be forced to pay fees to fully protect themselves from the fallout of Equifax’s data breach. Accordingly, we believe Equifax should, at a minimum, be taking steps to reimburse consumers who incur fees to completely freeze their credit..."
The participating attorneys general are from Alabama, Arizona, Connecticut, Delaware, Georgia, Hawaii, Illinois, Idaho, Iowa, Kansas, Kentucky, Maine, Maryland, Michigan, Minnesota, Missouri, Montana, Nebraska, New Hampshire, New Jersey, New Mexico, Nevada, North Dakota, Oklahoma, Ohio, Oregon, South Carolina, South Dakota, Pennsylvania, Virginia, West Virginia, and the District of Columbia. Read the announcement by Christopher S. Porrino, the State of New Jersey Attorney General. A copy of the joint letter is also available here (Adobe PDF). "The breach, which took place from mid-May through July of this year, neglected to keep important personal identifying information safe and allowed hackers to access names, Social Security numbers, birth dates, addresses and even some driver’s license numbers. As a result of this breach, approximately 209,000 individuals throughout the country are estimated to have had their credit card numbers stolen." "As a part of my commitment to safeguard the identities and personal information of Nevadans, my office will be working diligently with other states to investigate the cause of the Equifax breach... I encourage Nevadans to contact Equifax to determine whether their data was compromised, and to consider taking additional steps to protect themselves." The statement did not mention the other states the Nevada AG's Office is working with. Residents of Nevada should read the announcement which lists specific actions consumers in that state should take to protect themselves. "Under New York law, businesses with New York customers are required to inform customers and the Attorney General’s Office about security breaches that have placed personal information in jeopardy. The Attorney General’s Office investigates data breaches to determine if customers were properly notified of the breach and if the entity had appropriate safeguards in place to protect customers’ data..."
"1) Check your credit reports from Equifax, Experian, and TransUnion by visiting annualcreditreport.com. Accounts or activity that you do not recognize could indicate identity theft. This is a free service; 2) Consider placing a credit freeze on your files. A credit freeze makes it harder for someone to open a new account in your name. It will not prevent a thief from using any of your existing accounts; 3) Monitor your existing credit card and bank accounts closely for unauthorized charges. Call the credit card company or bank immediately about any charges you do not recognize; and 4) Since Social Security numbers were affected, there is risk of tax fraud. Tax identity theft happens when someone uses your Social Security number to get a tax refund or a job. Consider filing your taxes early and pay close attention to correspondence from the IRS." Annulacreditreport.com is the official site for free credit reports. The U.S. Federal Trade Commission (FTC) issued new rules in 2010 which addressed consumer confusion in the marketplace about sites offering free credit reports. When using unofficial sites, some consumers found the "free" credit reports weren't truly free because they included expensive subscriptions to credit monitoring services. "In addition to taking measures to protect their credit cards and bank accounts, New Yorkers should also think twice before clicking on any suspicious [e-mail] links claiming to be from Equifax or financial institutions... Hackers are resourceful criminals who are constantly looking to exploit any vulnerabilities... New Yorkers should be on the lookout for these possible attacks: a) Phishing emails that claim to be from Equifax where you can check if your data was compromised; b) Phishing emails that claim there is a problem with a credit card, your credit record, or other personal financial information; c) Calls from scammers that claim they are from your bank or credit union..."
"The FTC’s disclosure of an ongoing probe is highly unusual, underscoring the enormous stakes involved in the incident affecting what amounts to half the country." The news report cited comments by Peter Kaplan, the agency’s acting director of public affairs. So far, little is known which aspects of the breach the FTC is investigating. No doubt, there is more news to come. 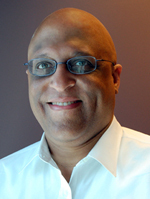 "... a cybersecurity incident potentially impacting approximately 143 million U.S. consumers. Criminals exploited a U.S. website application vulnerability to gain access to certain files. Based on the company's investigation, the unauthorized access occurred from mid-May through July 2017. The company has found no evidence of unauthorized activity on Equifax's core consumer or commercial credit reporting databases. The information accessed primarily includes names, Social Security numbers, birth dates, addresses and, in some instances, driver's license numbers. In addition, credit card numbers for approximately 209,000 U.S. consumers, and certain dispute documents with personal identifying information for approximately 182,000 U.S. consumers, were accessed." First, this is huge. Do the math 143 million persons is about 44 percent of the United States population of 325 million on July 4, 2017. So, almost half of the population was affected. Not good. But, there's more to this than size. Second, the announcement stated "approximately." So, the true number could be lower or higher. The vagueness suggests that Equifax doesn't really know exactly how many consumers were affected. Not good. And, other details support this assumption that Equifax really doesn't know. Third, the announcement stated "accessed." During the 10+ years I've written this blog, I've read dozens or hundreds of breach announcements. Many use this term. While the term may accurately describe what's Equifax knows, it also can be misleading. Criminals don't access companies' systems simply to window-shop or read files. They access systems to download and steal valuable information they can either use to make money, or resell to others. It's what online criminals do. Fourth, the data elements accessed stolen allow criminals to do a lot of damage. That might include: a) obtain fraudulent loans or credit in breach victims' names; b) impersonate breach victims (it's called pretexting) to access online accounts; c) with online access withdraw money from victims' bank accounts; and much more. With online access, criminals can change passwords and take over victims' accounts effectively locking out victims. "Equifax discovered the unauthorized access on July 29 of this year and acted immediately to stop the intrusion. The company promptly engaged a leading, independent cybersecurity firm that has been conducting a comprehensive forensic review to determine the scope of the intrusion, including the specific data impacted. Equifax also reported the criminal access to law enforcement and continues to work with authorities. While the company's investigation is substantially complete, it remains ongoing and is expected to be completed in the coming weeks." The announcement didn't state when Equifax expected the investigation to be finished. Days? Weeks? Months? Not good. Equifax hired an outside, independent technology firm to investigate its breach. That's what companies usually do during their post-breach response. This tiny bit of good news is quickly overshadowed by the bad. Without a completed breach investigation, Equifax can't really know whether the breach was caused by a technical systems problem, employee error, management oversight lapses, a sloppy or incompetent subcontractor, something else, or a combination of items. Only after a completed breach investigation can Equifax implement one or several fixes so this won't happen again. Not good. Sixth, without knowing how criminals accessed their systems it is unlikely Equifax also can't know with certainty what data elements about consumers were stolen. More data elements could have been stolen, perhaps entire credit reports. Not good. Seventh, it seems that Equifax's intrusion detection systems failed. Just look at the timeline. The breach started in mid-May and Equifax discovered it near the end of July. So, criminals had at least 2 full months to steal whatever they could find. Not good. Plus, after discovering the breach it would take Equifax another 5 weeks later to announce it. Why the delays? The breach announcement doesn't explain why. Not good. "Equifax has established a dedicated website, www.equifaxsecurity2017.com, to help consumers determine if their information has been potentially impacted and to sign up for credit file monitoring and identity theft protection." Setting up a website to convey breach updates to consumers is a good thing, but using the site to notify consumers about the breach is not good for two reasons: a) the site requires consumers to enter many of the same sensitive, valuable data elements criminals want to steal; and b) it forces consumers to trust that the breach site is secure, when we know that the breach investigation is incomplete. This is a breach notification failure. "In addition to the website, Equifax will send direct mail notices to consumers whose credit card numbers or dispute documents with personal identifying information were impacted." Rather than notify all breach victims directly, Equifax seems to want to take shortcuts. Maybe it is to save money, laziness, or poor decisions by its executives. The announcement doesn't explain why, so consumers are left to draw their own conclusions. Not good. "... the website www.equifaxsecurity2017.com/, which Equifax created to notify people of the breach, is highly problematic for a variety of reasons. It runs on a stock installation WordPress, a content management system that doesn't provide the enterprise-grade security required for a site that asks people to provide their last name and all but three digits of their Social Security number. The TLS certificate doesn't perform proper revocation checks. Worse still, the domain name isn't registered to Equifax, and its format looks like precisely the kind of thing a criminal operation might use to steal people's details..."
"... in the hours immediately following the breach disclosure, the main Equifax website was displaying debug codes, which for security reasons, is something that should never happen on any production server, especially one that is a server or two away from so much sensitive data. A mistake this serious does little to instill confidence company engineers have hardened the site against future devastating attacks." So, Equifax hasn't completed its breach investigation, doesn't know how its systems were hacked, has vulnerabilities in its main site, but wants consumers to trust that its breach site is secure. Not good. "Equifax has established a dedicated website... to help consumers determine if their information has been potentially impacted and to sign up for credit file monitoring and identity theft protection. The offering, called TrustedID Premier, includes 3-Bureau credit monitoring of Equifax, Experian and TransUnion credit reports; copies of Equifax credit reports; the ability to lock and unlock Equifax credit reports; identity theft insurance; and Internet scanning for Social Security numbers - all complimentary to U.S. consumers for one year." One year? Are Equifax executives serious? Stolen consumers' credentials don't magically lose value after one year. Criminals will use stolen credentials (e.g., name, address, Social Security Number, birth date, etc.) as long as they can. Criminals will resell stolen data to other criminals as long as the data has value. In my opinion, Equifax should provide complimentary lifetime credit monitoring indefinitely to all breach victims. Why lifetime? Because the data elements accessed stolen have ongoing value. The cynical part of me wonders if some finance executives have done the math. As long as credit reporting agency executives believe that one year of free credit monitoring will appease breach victims, it's cheaper to pay that cost (plus a few out-of-court settlements), rather than implement more robust data security. Eleventh, there is a history of questionable decisions by Equifax executives. In 2007, it paid a $2.7 million fine for violating federal credit laws. In 2009, it paid a $65,000 fine to the state of Indiana for violating the state's security freeze law. In 2012, Equifax and some of its customers paid $1.6 million to settle allegations of improper list sales. Earlier this year, Equifax and TransUnion paid $23.1 million to settle allegations of deceptive advertising about credit scores. This history provides some context to news reports that three Equifax executives sold about $1.8 million in stock after the breach was discovered and before the public breach announcement. Equifax stock fell about 13 percent after the breach announcement. The company said on Thursday that these executives didn't know about the intrusion when they sold shares. Even if true, the optics of this look absolutely terrible. The whole sordid affair should be a reminder to consumers that we are the product. Credit reporting agencies' true customers are lenders - the companies that lend money and make loans to consumers. Equifax makes its money selling credit reports to lenders. Assume the worst. Every time you hear or read the word "accessed" by Equifax, replace it with "stolen." Then, make your data security decisions accordingly. If you don't trust the security of Equifax's breach site, then call the company instead via the hotline listed in the breach announcement (preferably using a landline phone) to see if you are affected. Carefully consider the advantages and disadvantages of Equifax's offer of free credit monitoring and identity theft protection. Equifax has been criticized for forcing arbitration on consumers who accept the free credit monitoring offer. In a September 11th update in its breach site, Equifax reversed course and said the arbitration clause and class-action waiver don't apply in this incident. Regardless, read the fine print before signing up. They may try to re-insert it later. If you don't know what it is, learn about arbitration. A variety of companies have inserted these clauses into their user agreements policies. You'll need to learn about arbitration anyway in order to make informed purchase decisions about other products and services. If you don't need credit, consider a Security Freeze to lock down your Equifax credit reports. Then, Equifax can't sell your credit report to lenders. You can do this at all three major credit reporting agencies. I did this several years ago after a data breach by a former employer. Know that a Security Freeze is not a cure-all, since it won't stop data breaches and it won't stop all forms of identity theft and fraud. To learn more, this blog has plenty of information about credit reporting agencies, credit monitoring services, fraud alerts for your credit reports, and security freezes. If you dislike Equifax's post-breach response, then contact your elected officials and demand that they pressure Equifax to do the right thing: a) notify all breach victims directly via postal mail; and b) implement better data security. Equifax's post-breach response makes me question whether the company is really up to the data security task -- it's responsibility -- to adequately protect consumers' sensitive information. All credit reporting agencies are high-value targets by criminals. If Equifax's executives didn't understand this before, they should now -- and take actions to demonstrate to consumers they realize the seriousness of the breach. Words are not enough. Consumers lack choices. Citizens cannot opt in nor opt out of the data collection by credit reporting agencies. (Consumers can opt out of pre-approved credit offers, but can't opt out of the data collection. There's a difference.) Also, the Equifax breach highlights the hypocrisy of pundits and politicians who object to the mandate within Obamacare (e.g., the Affordable Care Act) legislation -- some called it socialism -- while remaining remain silent about a similarly socialistic mandate with credit reporting. While writing a post recently about misdeeds at Wells Fargo, I asked the question: "How much damage can one bank do?" Now, I find myself asking a similar question about Equifax: "How much damage can one company do?" Credit and lending are essential to the United States economy. In my opinion, all credit reporting agencies should have NSA-level data security for their networks and computer systems. The data they archive is that critical. And: if you can't protect it, don't collect it. It's that simple. As more issues emerge about this breach, I will address them in subsequent posts. What are your opinions of the Equifax breach? Did you lock down your credit reports with a Security Freeze? "TransUnion, since at least July 2011, and Equifax, between July 2011 and March 2014, violated the Dodd-Frank Wall Street Reform and Consumer Financial Protection Act by: 1) Deceiving consumers about the value of the credit scores they sold: In their advertising, TransUnion and Equifax falsely represented that the credit scores they marketed and provided to consumers were the same scores lenders typically use to make credit decisions. In fact, the scores sold by TransUnion and Equifax were not typically used by lenders to make those decisions; 2) Deceiving consumers into enrolling in subscription programs: In their advertising, TransUnion and Equifax falsely claimed that their credit scores and credit-related products were free or, in the case of TransUnion, cost only “$1.” In reality, consumers who signed up received a free trial of seven or 30 days, after which they were automatically enrolled in a subscription program. Unless they cancelled during the trial period, consumers were charged a recurring fee – usually $16 or more per month. This billing structure, known as a “negative option,” was not clearly and conspicuously disclosed to consumers." Credit scores are numerical summaries designed to predict consumer repayment behavior and while using credit. Those numeric summaries attempt to indicate a consumer's credit worthiness based up like their bill-paying history: the number and type of credit accounts, the total amount of debt, if the credit accounts are maxed out, the age of that debt, whether bills are paid on time, collection activities by lenders to get paid, and the age of the consumer's accounts. "... are based on a model from VantageScore Solutions, LLC. Although TransUnion has marketed VantageScores to lenders and other commercial users, VantageScores are not typically used for credit decisions." Generally, the higher a credit score, the less risky that consumer is to lenders. The U.S. Federal Trade Commission (FTC) has a helpful site that explains credit scores and provides answers to common questions by consumers. "TransUnion and Equifax must clearly inform consumers about the nature of the scores they are selling to consumers... Before enrolling a consumer in any credit-related product with a negative option feature, TransUnion and Equifax must obtain the consumer’s consent. TransUnion and Equifax must give consumers a simple, easy-to-understand way to cancel the purchase of any credit-related product, and stop billing and collecting payments for any recurring charge when a consumer cancels." "Negative option" is when a free trial automatically converts to a monthly paid subscription if the fails to cancel during the free trial period. Historically, the three major credit reporting agencies have offshore outsourced call center operations. So, it will be interesting to see how many of these jobs return to the United States given the policy positions of the incoming President and his administration. And, the industry has come under scrutiny for failing to fix errors in the credit reports they sell. The industry has had some spectacular information security failures. A May 2016 breach at Equifax exposed the sensitive personal information of more than 430,000 employees of its Kroger supermarkets client. In 2012, Equifax and some of its customers paid $1.6 million to settle allegations by the FTC about the improper sales of customer lists from January 2008 and to early 2010. "TransUnion and Equifax deceived consumers about the usefulness of the credit scores they marketed, and lured consumers into expensive recurring payments with false promises... Credit scores are central to a consumer’s financial life and people deserve honest and accurate information about them." Kudos to the CFPB for this enforcement action.